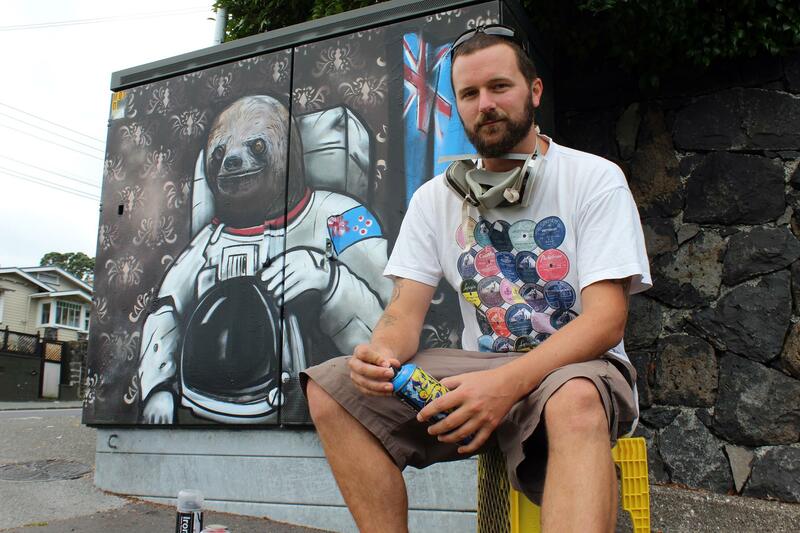 Paul X Walsh is New Zealand’s most prolific public artist, with a dozen murals and over 50 utility box artworks around the country. Born and raised in Rotorua, he has lived in Ngongotaha, Wellington and London, and is now based in Auckland. He has been working as a full-time artist since 2014, before which he held down a wide range of jobs – including website design, DJing, selling travel books, working in music stores, making sandwiches and washing dishes. Paul works in a range of mediums, from spraypaint to watercolour, and describes his style as ‘pop surrealism with a side order of memes’. 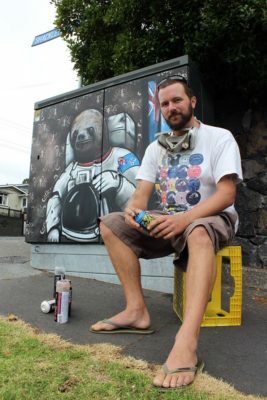 His art has been featured on multiple news websites and blogs – Newshub, My Modern Met, Laughing Squid, Central Leader, Canadian Broadcasting Company, the front page of Reddit and CNN’s Headline News, amongst others. The ‘X’ in his name was an addition inspired by Simpsons / Futurama writer David X. Cohen – it serves to distinguish him from the famous English footballer with the same name. He spends his time working on a wide range of commercial, public and private commissions, playing vintage video games, and going on bushwalks with his two young children.